Lambeth Palace Library MS 233 f.15r. Glad you are back for another perplexing manuscript picture. It's hard to believe these two grotesques are from the lovely Vaux Psalter. Just look at the left grotesque's fearful dirty look. Dramatically amazing. But what is it? And why? Michael Camille in his book Image On The Edge calls it a "gryllus design", a head upon two legs vaguely like a field cricket. Camille does not believe - as some scholars do - that marginal images are religiously repressed unconscious images or doodles. The gryllus had special meaning to those in the Middle Ages and goes back many years before that. It stood for the sordid baser instincts trapped within one's body leading you away from Christ's higher truth. Remember also in the Middle Ages people believed eyes emitted rays and didn't receive them. To them, that was how vision worked. Thus the phrase "if looks could kill" was real for them. One last detail about this gryllus. 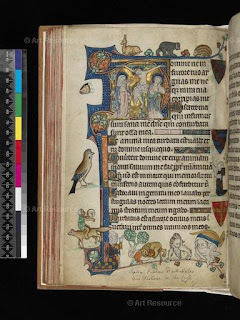 The artist exactly repeated it in the Grey-Fitpayn Psalter illustrating how Medieval scribes copied their motifs using them in more than one manuscript. Both manuscripts are 14th century and held by the Fitzwilliam Museum, Cambridge, UK.